His mum wanted him to grow up to be somebody. He grew up to be..(almost) everybody. Invite Liam Neeson, Billy Connolly, Morgan Freeman, Robert Deniro, Dr. Phil...and a host of others to your function and get the laughter started! Danny presents a sensational 5-star multi-media experience! Super-Impressionist Danny McMaster is one of the hottest performers in Australia. His star-studded show is considered a "must-see" entertainment experience and one that audiences want to experience over and over again. Available for private & public performance. 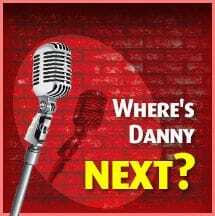 If you have a conference, seminar or any type of corporate function, perhaps a sports breakfast, luncheon or dinner, where you need 'something different', or wanting that 'special something with a touch of class', then you can't go past Danny McMaster and his ever-expanding repertoire of impressions.